This is the final installment of my "salute" to Amazon during the time Amazon is saluting Indy authors. I've already posted about how finding out about Createspace and KDP liberated my creative inclinations so I could write and publish all the Izzy Elves stories as paperbacks, downloadable audio books, audio book CDs, and (soon) Illustrated Audio Books via Amazon Video Direct. Today I'd like to add a different kind of salute, to Amazon as "muse." (I keep trying to make a pun-type thingy of A-muse-zon but that doesn't work too well so I won't.) If I did, I would use this horrible pun to refer to the fact that even when I don't actually publish something myself using the Amazon platforms, just knowing that they are available in case I need them has served as a powerful inspiration to me as a writer. Case in point: A Buss from Lafayette. This is a story for which I conceived the main idea almost twenty years ago. I did a lot of reading about Lafayette during those years, but I couldn't make myself actually finish writing this book. As there was no guarantee that I could find a publisher for it, it just seemed rather pointless to complete this project. Then I heard about Createspace and KDP. Once I knew that I could publish A Buss from Lafayette myself if I had to, my whole mindset changed and I started working on it in earnest. It took about three years to do the necessary research and create the fictional bits. In the end, I did find a publisher (thank you, BQB Publishing) which did a beautiful job of helping me polish Buss up for publication. It was knowing that I had Amazon as a Back Up Plan that made it possible for me to write this story with confidence it would be published, no matter what. 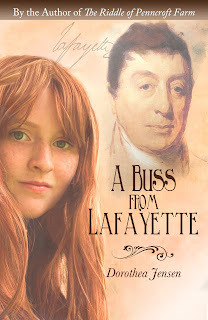 Finally, A Buss from Lafayette was just named a quarter finalist in the Booklife Prize in Fiction! None of this would have happened without "A-muse-zon"!